If you are looking for individualized attention and assistance in reaching your goals, then our one-on-one training is for you. Your trainer will help you set and achieve realistic fitness goals based on what you want. Not motivated to work out on your own or one-on-one with a trainer? Gather your friends, family members or co-workers to form a small group of 2-4 people. This will allow you to get the instruction you need to achieve your goals while getting support and motivation from the other members of your group. You will need to have your members of your group selected when you sign up. 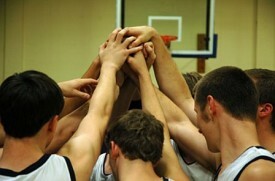 BucksFit specializes in custom team training programs. We believe that special attention should be dedicated to preventing injuries during the season. Prepare for the upcoming sports season with one of our experienced and certified professional staff members. 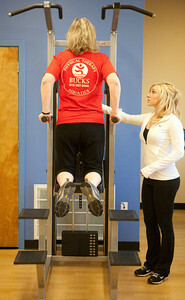 The training is overseen by Doctors of Physical Therapy and is designed to guarantee positive results. During your team’s initial training session, one of our sports Physical Therapists will screen your athletes for ACL injury risk. Following this, one of our experienced strength and conditioning staff members will provide a comprehensive fitness evaluation and then design a program to meet the injury prevention and athletic development needs of your team. BucksFit offers two different team packages. Each package includes 2x/week training. 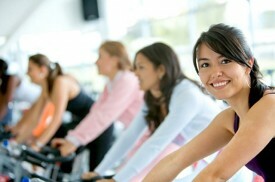 Choose either the 8 session (2x/week for 4 weeks) or 12 session (2x/week for 6 weeks) package. Both packages require a minimum of 5 athletes training together and must be prepaid. More athletes equal greater savings per athlete. BucksFit’s Prevent Injury and Enhance Performance program focuses on educating athletes on strategies to avoid injury and includes specific exercises targeting problem areas. BucksFit offers the PEP program to implement a strategic training program to decrease the number of ACL injuries. What Does the ACL Program Consist of? The program consists of a warm-up, stretching, strengthening, plyometrics, and sport specific agilities to address potential deficits in the strength and coordination of the stabilizing muscles around the joint. The trainers at BucksFit will emphasize correct posture, straight up and down jumps without excessive side-to-side movement, and reinforce soft landings. This program should be completed 3 times a week. Warm-Up: Warming up and cooling down are crucial components of the training program. The purpose of the warm-up is to allow the athlete to prepare for activity. Stretching: Never stretch a “cold muscle”. By stretching after a warm-up, you can improve and maintain your range of motion, reduce stiffness in your joints, reduce post-exercise soreness, reduce the risk of injury and improve overall mobility and performance. Strengthening: This portion of the program focuses on increasing leg strength. This will lead to increased leg strength and a more stable knee joint. Close attention must be paid to the performance of these exercises in order to avoid injury. Plyometrics: These exercises are explosive and help to build power, strength and speed. The most important element when considering performance technique is the landing. It must be soft! These exercises are basic; however, it is crucial to perform them correctly. Agilities: These exercises increase dynamic stability of the ankle/knee/hip complex.